On Thanksgiving night, Mr. Myrt treated us to the evening screening of 'Lincoln'. I found it most interesting. From the research we've done visiting Lincoln-related sites this past year, and our study on and offline, we were amazed that the characters and settings seemed particularly believable. "Allen Guelzo is the director of the Civil War studies department at Gettysburg College. He is the author of a magnificent new history of the Civil War and Reconstruction (why these periods are always separated into different volumes baffles me) as well as important studies of Abraham Lincoln's religious views and theemancipation proclamation." 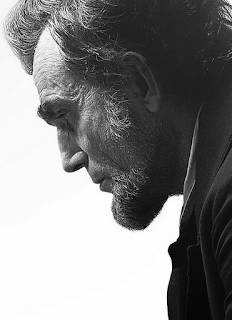 “Lincoln” is a rough and noble democratic masterpiece — an omen, perhaps, that movies for the people shall not perish from the earth." THE NEW YORK TIMES A.O. Scott. "Lincoln" is the most substantial, thoughtful, politically wise, historically well-informed, dialogue rich, and truly dramatic movie that I have seen in a long, long time. It is a tribute to the film industry that along with all the car-chase and ticking-time-bomb box office hits, we are still able to create and sustain a movie like this. Kudos! And I'm going to buy Doris Kearns Goodwin's biography of Lincoln.